Como is the biggest settlement on Lake Como but the city centre still retains the simple architectural beauty that you’ll find in smaller towns all around the lake and there’s lots to occupy your time here. 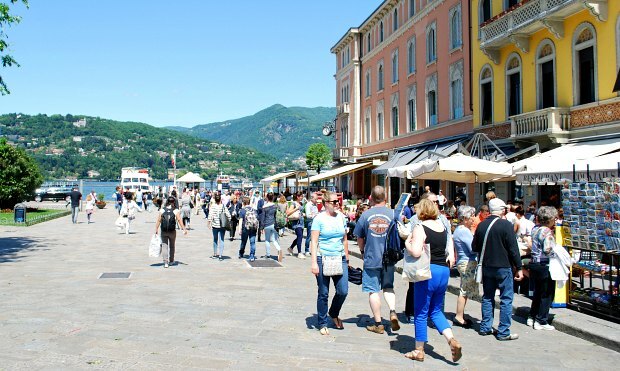 The best way to enjoy Como is simply by walking around the centre area. The streets are narrow in some place and wide in others, but they’re all lined with traditional Italian lakeside buildings. Head for the main pedestrianised square outside the Duomo where you’ll find outdoor seating for the surroundingy cafes. Then walk down to the lakeside to get a great view of the lake and see the historic Palace Hotel. In front of you will be the small harbour area and if you cross the main road and walk along the lakeside, you can walk either up to area at the base of the funicular or in the other direction towards the war memorials and the Tempio Voltiano science museum, which looks like a mini stately home. 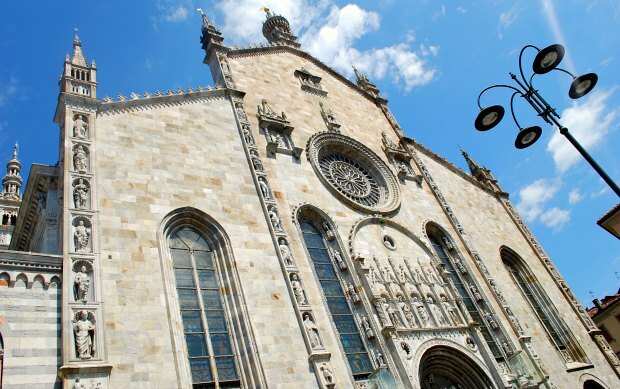 Whilst the Duomo here is small compared to nearby Milan, it’s still a big highlight of a any trip to Como and unlike Milan, admission is free! Outside stand back so you can see the green copper top to the dome, then study the carvings on the facade. Inside, head to the edge of the altar and look up, to get a great view of the inside of the decorated dome. It’s here that you get a real sense of the years of work that went into to creating it. Just sitting on the chairs, we found it to be a real calming experience – a great place to contemplate life, whether you have faith or not. The funicular in Como (Funiculare Como-Brunate) takes you from the harbour area up to the hillside village of Brunate. 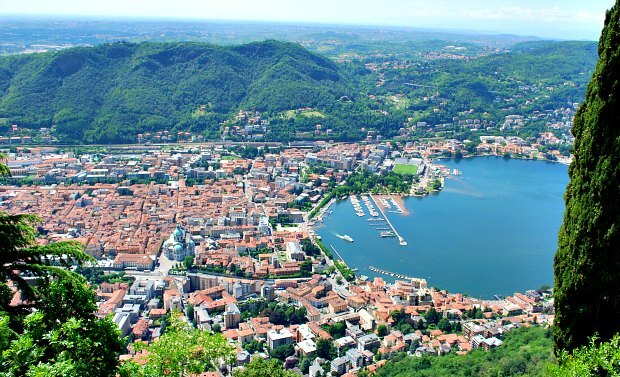 Here, you’ll be rewarded with incredible views of Como like the one above. There are also a number of eateries and the beautiful church of Sant’ Andrea which has incredible painted ceilings. We didn’t find riding the funicular a particularly pleasant experience however. On busy days, there is a substantial line to wait in to buy your tickets and then the cars are jam packed – you feel a bit like a sardine! The best way to avoid this, is to arrive early in the day for your trip or head to the funicular when everyone else is coming down. Villa Olmo stands majestic on the side of the lake, a short walk from the centre of Como. Its construction began in the late 1700s and like many properties of its kind, it was meant to be a summer retreat for a wealthy family. Today it belongs to the municipality of Como and the gardens are open all year round to wander around. The Villa itself is well worth seeing though, however you can only get access when exhibitions are taking place inside. When we visited, there was a sculpture exhibition on, but to be honest, the villa itself was the bigger attraction for us. If you can get access, make sure you look up! 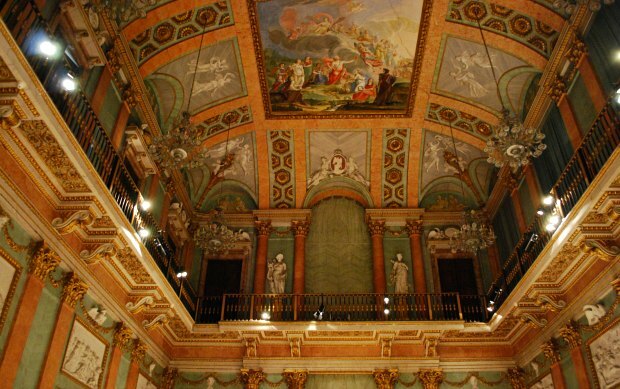 The painted ceilings are amazing.